Here’s a great perk of being a member of an airline’s mileage program. 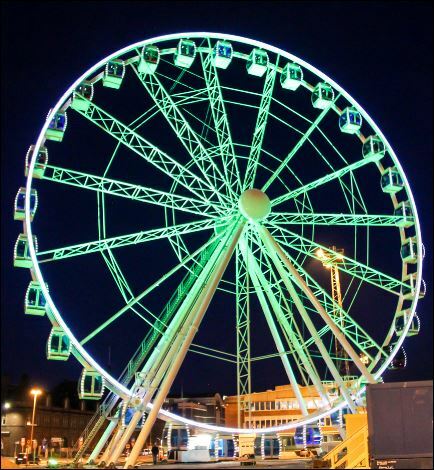 A new 460-foot observation wheel – called the Finnair SkyWheel – began turning in Katajanokka harbour in central Helsinki on Tuesday and on Sunday, June 8th, all Finnair Plus members who show up between 9 a.m. and 4 p.m. will get to take a spin on the wheel for free. All other times, Finnair Plus members get a discount. The big wheel has 30 climate-controlled blue-and-white gondolas plus a special VIP cabin with a glass floor, leather seats and Veuve Clicquot champagne service. One trip on the Finnair SkyWheel lasts 15 minutes and costs about $16. The ride in the VIP cabin lasts 25 minutes and costs about $265.